Inscriptions: u.r. handwritten in pen: "43"; u.c. handwritten in pen: "have gold background extend over whole 23" square"; u.r. handwritten in pen: "do in these colors / gold - use stronger gold / red / black- / big G in black "Your name" etc in black"; l.r. handwritten in pen: "use red of the heart on no. 44A"; l.l. 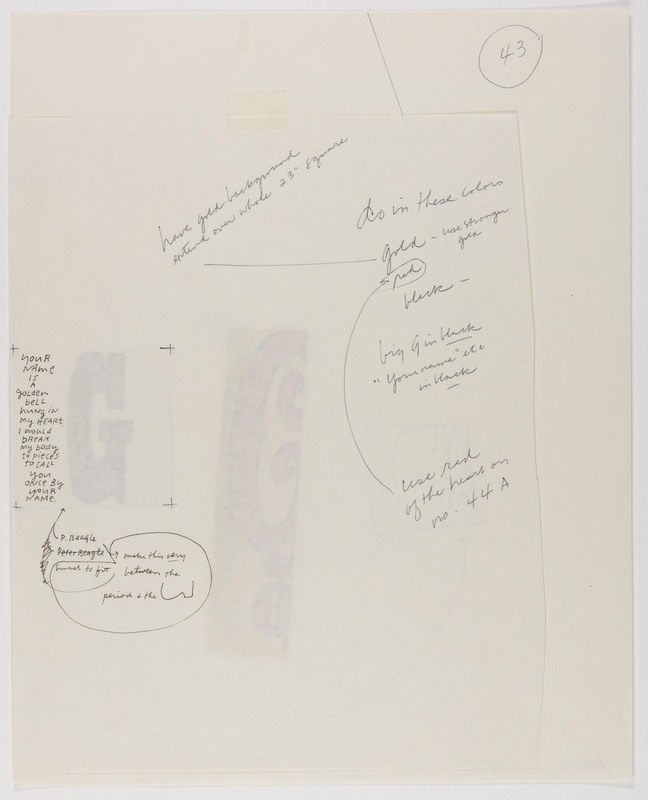 handwritten in ink: "make this very small to fit between the period + the"
"Untitled." Corita Kent in the Grunwald Center Collection. Los Angeles: Hammer Museum, 2017. https://​hammer.ucla.edu/​collections/​grunwald-center-collection/​corita-kent/​art/​untitled-preparatory-materials-for-g-greatest-show-of-worth/​.